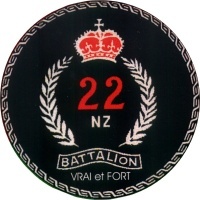 The 22 Battalion was the first of the Allies to enter Trieste and thus end the war in Italy. Colonel Donald arrived first and negotiated the surrender of all German forces in Italy. A short time later the Yugoslav forces arrived and attempted to wrestle control. But Donald remained firm. The German garrison, camped in the old hilltop Castle San Giusto agreed to surrender only to the New Zealanders and some of the 22 Battalion spent the night there, along with the German troops who shared their dinner of horsemeat stew. The German SS troops, barracaded in the large Tribunale building refused to surrender and it took some point-blank shooting by the tanks to force them out. Sylvia Sprigge was a British journalist based in Trieste. She documented the arrival of the 22 Battalion in photographs and later published these in a book. The photogrpahs are reproduced here. The 22 Battalion arrival in Trieste was well documented. There is a collection of photographs here. In 2005, 100 men and families returned to Trieste for the 50th anniversary of the end of the war in Italy. There were 22 men of the 22 Battalion on that trip. This is a personal diary of the Return to Trieste.